Yes, I did set a new distance record of 35.4 miles in one day! (It was 33.4 trail miles and 2 blue blaze miles into town. Which, the blue blaze used to be the actual AT, so I’m going to skip those 2 white blaze miles in the woods and pick back up at Rt. 15. Purists won’t agree. But at this point I think the AT had it best when it was mostly road walking through Maine. Not that Maine isn’t beautiful in the woods, but it remains wet and boggy even days after it has rained. And now that it’s raining all day here on 8/29 I can’t imagine how muddy the trail will be these next few days.) I wasn’t alone for those 35.4 miles. It was myself, Daddy Long Legs, and Rocket. There was rumor of a hurricane coming our way. So what was supposed to be an 18-mile day, lengthened to a 27-mile day, and then onto a 35-mile day with the drive to seek actual shelter. Why not? For the last 3 hours we were using head lamps and walking long after the sun had set. Total walking time was from 8:30am to 10:30pm with several breaks thrown in. Sweet. Save the hardest part for the end. You begin the climb from the last shelter which is at 1,070 feet above sea level. 5.2 miles later you’re standing on top of the Baxter Peak of Mount Katahdin, northern terminus of the AT, which sits at 5,268 feet. Yikes. Then, and here’s the really fun part, you get to walk back down to where you started. 5.2 miles of backtracking. Anyone own a hellicopter and want to meet me at the top? My plan is to try and stick with Daddy Long Legs and Rocket until the end, mainly because I enjoy their company, but also because when we leave Monson tomorrow we enter what is known as the “100-Mile Wilderness.” Doesn’t that sound inviting? That’s basically 100 miles of walking without a major road crossing, nay, not even a secondary road crossing. So it’ll be nice to have some company through there until we reach Baxter State Park where Katahdin is located. 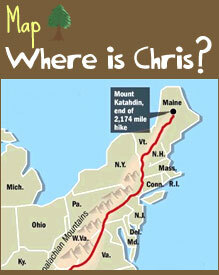 Finally, upon scrambling back down Katahdin, the plan is to get a ride from Jason (the producer of the show for which I’m filming) to the town of Bangor, ME, where I’ll pick up a rental car and drive 1,000 miles to Ohio in the amount of time I normally hike 30 miles. Unless anyone knows someone who works for an airline and can get me a “buddy pass” so I can fly home stand-by out of Bangor? I should have asked for that sooner. Oh well. It’s too risky to have bought a plane ticket not having 100% certainty that I’ll be able to summit on the day I’ve planned. I’m going to attempt to get another 10 hours of sleep tonight because that sounds fun. Cell phone service has been increasingly more difficult as you can imagine. Seriously, you should google-map Monson, ME. Not a whole lot going on out here. I’m thankful enough to have made it this far that I could happily go home now. But I guess I’ll push on since SOMEONE decided the trail needed to end on Katahdin. But seriously, and more on this later, I know I wouldn’t have made it this far if it hadn’t been for your prayers and encouragement. Especially since I was praying for a way out, and you instead prayed for perserverance, strength, and a way through. Even if you’re not a blog-commenter, if you’re reading this now, which I assume most of my friends are, I appreciate you coming along with me. I’ll also have some closing thoughts on not reaching my goal of 2,200 kids sponsored in the days and weeks ahead, but that’s not to say we can’t finish strong. Maybe we should make our goal 100 kids by the end of September. Then when Oprah or Good Morning America picks up my story, we’ll push for the 2,200 again. I’ll probably have the total up through the end of August by the next time I write. (Banner update, ahem, Brian?) We’re up to 11 as of the end of July! That’s 11 kids who now know someone in the United States who has a big enough heart and a little extra in the pocket book to send help and hope to them. 11 more kids who know without a doubt we care for them, even if we never meet them face to face. The stories are true. Their first breath had them on a path that stacked their odds against them. But your first breath, presumably here in the US, has you on a path that is able to intersect with and redirect the lives of others. Thank you for being willing to give! Ohio friends: Tentative party on September, 8th at Frankfort Pizza in Frankfort, OH, for dinner. YES. Tennessee friends: McCrearys or Mellow Mushroom, date and time are TBD. Holland friends: Ik mis u kerels en hoop om u spoedig te bezoeken. Trail friends: Mi casa es su casa if you ever pass through Franklin, TN. All other friends: I’ll try and see you ASAP. Or…come visit me on tour!!! 8/19 17 miles. Tough day, saw 2 snakes. In Maine now, last state! 8/20 16.4 miles. Completed the notorious Mahousuc Notch and Arm. Tough miles. 8/21 18.1 miles. Exhausted myself on the last mile. I was spent.8/22 13.3 miles. Slack-packed with Jason, started too late, had to hike w/headlamp in the rain to finish. Yuck. Saw 2 MOOSE (moosen? meese) while driving back from the trail. HUGE. 8/23 14.9 miles. Not a bad day but ready to get Maine over with. 8/24 16.9 miles. Food doesn’t taste normal. Maybe I’ve dehydrated myself. 8/25 13.5 miles. Short day into Stratton, ME. Staying at the Stratton Hostel. 8/27 19.9 miles. Nice, easy terrain. Ferried across the Kennebec River, the largest unbridged river crossing on the AT. Free ferry service because it’s too difficult and dangerous to ford. 8/28 33.5 miles (+2 blue/old AT). Had two decent climbs. Also had to ford 2 rivers = wet feet. Hiked from miles 16 on with Daddy Long Legs and Rocket. Decided to try to get to town to avoid the rain. 8/29 0 miles!!! Sitting in a nice hostel called the Lake Shore House. Avoiding the rain, contemplating an early dinner and an early bed time. 2,000 down. A few to go. Yes, I crossed the 2,000 mile mark today. 2,000 miles hiked on foot since March 29, 2009. The saddest part is I’m too tired to comprehend this at the moment. Honestly, I haven’t been feeling 100% these past few days, not sure why either. Appetite isn’t even the same. Your prayers are appreciated these last 200 or so miles. However, I’m planning on taking Sunday off as my last zero day. I shall prepare a more thorough, as well as my last, blog from the trail then. Maine has been…well…okay on the days it’s not raining. I’m still experiencing my fair share of weather. There’s a phenomenon called “Katahdin Blinders,” and I have a full-blown case. Just looking forward to the end. And hugging you, all my friends and family. Ok, I’m going to bed ASAP in hopes that I feel better in the morning. Yes, it’s only 6:10 pm here in Stratton, ME. …because you know you’re getting mine! 1. Staying at Huts (which are normally $70-$100) but thru-hikers can do “Work For Stay” for a few hours a night and stay free!